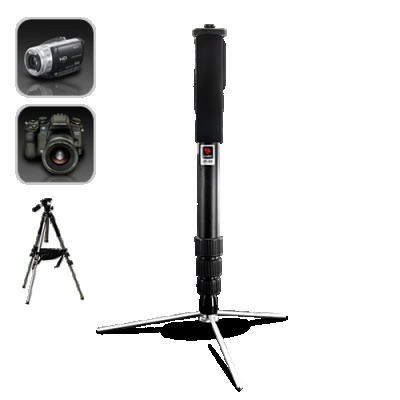 Successfully Added Benro Classic Aluminum Monopod with 4 Twist Lock Leg Sections to your Shopping Cart. Benro Classic Aluminum Monopod with 4 Twist Lock Leg Sections to offer professional photographers the ultimate in strength, lightweight, fast-action, and reliable performance. (1) Closed cell foam grip that acts as an insulator, adding comfort. (2) Improved rubber dust-resistant leg lock design prevents dust or moisture from entering the interior of the twist-locks. (3) Anti-rotation leg locking system prevents unwanted leg rotation even when the legs aren’t locked into place, enabling fast and fumble-free camera set-up. (4) A handy hand strap is incorporated into the monopod for easy carrying. The Benro monopods have always been the first choice for photographers who need the lightest weight support, or who are limited in working space or photograph events that are constantly on the move. Now offered from Chinavasion at a wholesale price that can’t be found anywhere else on the internet. Order yours today and it gets shipped within a day! This is the upgraded 2nd generation of Benro’s well known MA-96EX series monopods. The new version is lighter and easier to carry.